The sleek and streamlined 59 1/4″ Fontenay blends symmetry and style in one magnificent Range. 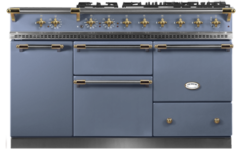 With your choice of a larger Gas or Electric Traditional Oven and and two Vertical Warming Cupboards, the Fontenay offers ample workspace and numerous cooktop configurations. Choose from Classique, Traditional of 4-Burner Hobs that complement additional accessory burners or a continuation of your work space. 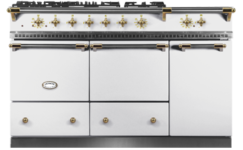 Click the button below to configure a Fontenay moderne that is perfect for your kitchen. 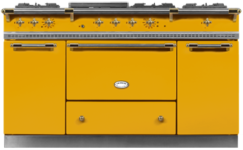 The Classique top features an open grate over the central 18,000 BTU burner. This option is ideal for sautéing and searing. A portable simmer plate will accompany this option to round out your cooking needs. The two 15,000 BTU burners on the far left can be replaced with two 11,000 BTU burners. 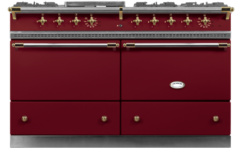 The Traditional top features a built-in cast-iron French plate over the central 18,000 BTU burner. Those looking to sauce and simmer with finesse over a large surface area will love the Traditional top. It is possible to remove the center plug & still have direct access to the central burner, which is ideal for wok cooking. The two 15,000 BTU burners on the far left can be replaced with two 11,000 BTU burners. 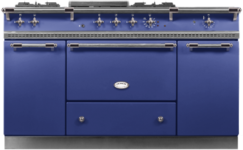 The larger Sully-sized oven is 21w x 12h x 18d (*16d with convection). The warming cupboards are 13w x 20h x 21d. Your choice! 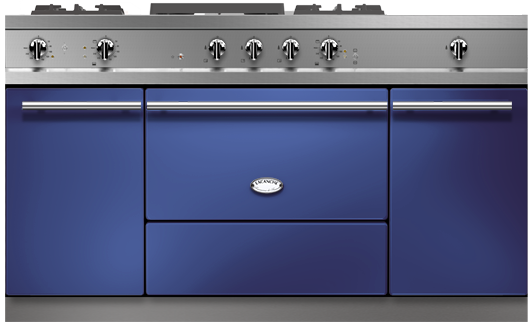 You may choose to make the large Sully-sized oven gas or electric convection which comes with a toggle switch to convert to static electric. The warming cupboards will be electric. Yes! If you choose to have an electric oven it will come standard with a toggle switch that allows for conversion between static electric and convection electric. Our matte black finish is considered to be standard, and all other color finishes, including stainless steel, are considered to be premium color finish upgrades. The color upgrade charge for a Fontenay is $1300. There are four options: brass, brushed stainless, chrome, and nickel. Brass is considered “standard” and there will be no upgrade charge. The trim upgrade charge is $500. A. For the Fontenay model, choose an overhead canopy with the following optimum specifications: 66″ wide (72″ for Fontenay island applications) x 24-27″deep. B. Blowers should be rated at 900-1300 cfm, with 10″ round ducting, or equivalent. Size should be measured by the style and quantity of cooking, i.e. Asian stir-fry (vaporized grease) requires higher performance blowers than French reduction (steam). C. Hood can be mounted to wall or ceiling 30″-36″ (from hood base) off cooktop. Check with your hood company for specific requirements.